On Friday night while watching Taiwan struggle to a valiant 2-0 defeat against North Korea, I saw something of a phenomenon; Taiwanese fans wearing Crystal Palace shirts. The western media and commentators often have you believe anytime a club signs a player from East Asia it’s only to raise shirt sales, which is obviously a load of tripe because most people in East Asia already follow a big club, and that isn’t going to change by some club like Burnley signing an Asian bloke. Still, I was surprised to see Taiwanese fans to be rocking a few Palace shirts and it can only be put down to one man, Will Donkin who most Palace fans haven’t even seen play yet. Just because he is going to be a big hit in Taiwan though doesn’t mean he will sell millions of shirts in Asia. Will Donkin is already huge within Taiwan’s small football going public, and there is no telling how far his potential can take him. 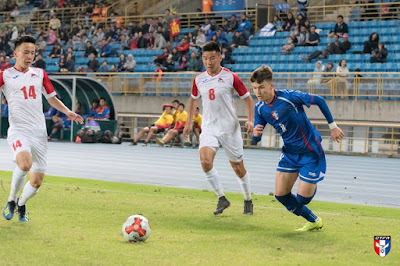 The best thing for Taiwan would be if he develops well enough to play Premier League football, then he would be the first ever Taiwanese football to play at one of the highest level leagues in Europe. Up until now, the highest level a Taiwanese player has played at was Xavier Chen at KV Mechlen in the Belgian Pro League, and Chen Po-Liang in the Chinese Super League, but if Willy Donks managed to break into to Crystal Palace’s first team he would do wonders for football on the island. If that ever happened I think Taiwanese people would be overjoyed and then for once the media/commentators could possibly be right about Asian players helping a club become huge in Asia, Palace would for sure become huge in Taiwan if Donkin became a key player for them in the future, however he has a long way to go but as far as Taiwan pinning their hopes on a bright young talent for the future he is all they have. So I was surprised to see Crystal Palace shirts on Taiwanese fans, but that can solely be put down to one thing, the big Willy Donks effect.